Wood & Brewer LLC is a debt relief agency with over 15 years’ experience serving Mount Vernon, Ohio. YOUR CASE. YOUR LIFE. OUR PRIORITY. With a number of firms to choose from when it comes to bankruptcy, why should clients hire our team at Wood & Brewer, LLC? Plain and simple: We truly care about your life and your case. We make you a priority in everything we do and keep our focus on achieving the most favorable results for you. When you call our Westerville bankruptcy firm, you will speak directly with your attorneys. This personal attention means you can express any concerns you may have and ask any questions and have the answers promptly. We know how to help you achieve a fresh start, and you can trust that your needs are atop our priority list. Obtain the fresh financial start you deserve in Mount Vernon, Ohio! Call our bankruptcy lawyers at (614) 410-6878. 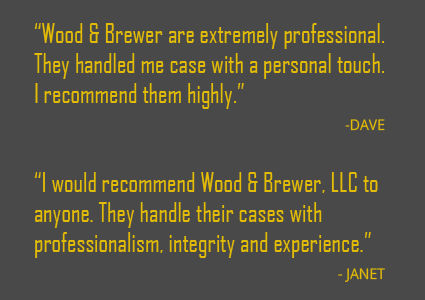 Please Schedule Your FREE Case Evaluation With Wood & Brewer Today! No matter how complex your case may seem, you can have confidence in our Westerville bankruptcy attorneys as we have handled all aspects of Chapter 13, Chapter 7, and debt settlement matters. You will always receive carefully analyzed advice on which chapter of bankruptcy serves you best and ways to help rebuild your credit after the fact. Wood & Brewer, LLC is 100% dedicated to helping our clients reach their goals. By entrusting us with your bankruptcy matter, you can be sure that we will work to get through this together. Ready for your fresh start? Let us help you get there! Our bankruptcy attorneys serving Mount Vernon are ready to discuss your call. Request a consultation!